In this edition of "Did You Know," we introduce the first in the three part series "Back-Road Adventures in Oregon". Learn about Fort Rock State Park and the incredible history behind it. 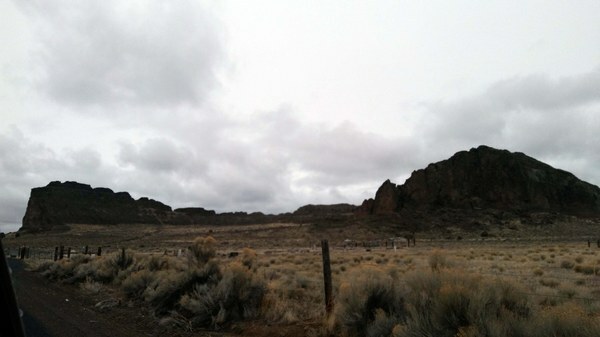 Fort Rock State Park is a geological wonder located just outside Christmas Valley, Oregon. It's a 5-6 million year old horseshoe shaped volcanic maar, formed of tuff breccias that tower some 325 feet above the flat desert floor. It was formed when super heated basalt magma came into contact with ground water, causing an explosive eruption. Within the valley, you'll find many exciting places, including the lost forest and fossil lake as well as sand dunes, which you can learn more about on the BLM’s website. Crack in the Ground and Hold in the Ground are also popular destinations, both of which will be covered in the upcoming installments of Back-Road Adventures in Oregon. The whole area is a living testament to Earth’s magnificent power. Fort Rock rising out of the Fort Rock Valley. Photo by Regina Robinson. As you drive through the arid desert on a highway of chipped obsidian and basalt, it's hard to imagine that this valley was once 200 feet below water, a lake with marshy borders and a tropical environment. The abundant rain and lush vegetation supported Pleistocene animals such as giant beaver, measuring over seven and a half feet long, camels, woolly mammoths, horses, sloths, and bison. The landscape was transformed by ancient volcanic activity; active fault lines and a changing climate created the rain shadow effect. The ‘rain shadow effect’ is a consequence of the Pacific oceanic air not being able to climb up over the Cascade Mountain Range. With the active subduction of the tectonic plates forcing the mountains higher, the moist Pacific Ocean air gets trapped on the west side of the mountains leaving very little, if any, for the thirsty desert. Once you get to Fort Rock the trail is lined with historic plaques detailing the local geological history. The scale of this ancient extinct volcano is massive and awe inspiring. The hiking distance is roughly 2 miles, and the route is mostly sandy and slightly rocky in some areas. The brush can be thick, and with an elevation gain of 300 feet, it can feel daunting in the extreme heat. 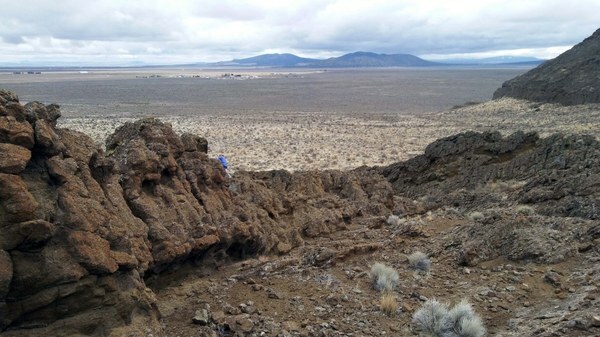 There are two main hiking trails that ascend to the rim of the maar, where you can catch an amazing view of the surrounding countryside of scrub sage bushes and various other volcanic features such as Table Rock, Green Mountain, and Flat Top. The weather can be unpredictable, and there's no shade or cover. Additionally, though many of the roads are graded gravel, some portions are sand. Even the graded roads can quickly become messy sinkholes, especially out near the Lost Forest and the Sand Dunes. A gentle reminder to keep adequate fuel, a shovel (for digging your car out), overnight gear, and extra food/water in your vehicle in case you have an emergency. Fee: No fee at Fork Rock. Amenities: There are toilets, picnic tables, and running water. Pets: Please do not bring pets on hike. Items: Ten Essentials, binoculars, camera, and a sense of adventure. Standing atop Fort Rock, looking northwest across the valley as Mac McKay explores. Photo by Regina Robinson. Want more? Check out the second installment of "Back-Road Adventures in Oregon", where we explore Hole in the Ground and Crack in the Ground.